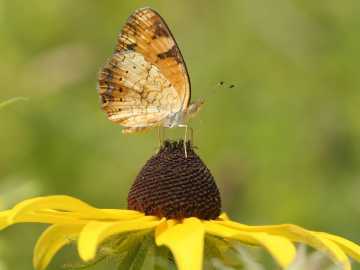 This small pearl crescent butterfly perches with wings closed on a black-eyed Susan flower, revealing the crescents along the edges of the pale underside of its wings. It has uncoiled its “tongue” and is using it like a straw to sip nectar from the flower. Along with Fourth of July festivities comes the height of butterfly season, featuring butterflies large and small in Westborough. Besides the familiar stars of the show, such as mourning cloaks, monarchs, viceroys, black swallowtails, and tiger swallowtails, we have small, pretty butterflies that are well worth watching and getting to know, especially the pearl crescent (Phyciodes tharos). The pearl crescent sideshow is conveniently local. If you notice a pearl crescent, or quite possibly, several of them, the chances are good that these little butterflies will stay in the same area instead of flitting off to some distant blossoms. Why are they so local? They’re territorial. Males tend to patrol an area, chasing away other pearl crescent males and approaching females that happen by. If a pearl crescent flies away, it will probably soon circle back to the same area or even the exact same spot. The pearl crescent show is also conveniently long-running. These little butterflies are around from mid-May to mid-September. You can see their show almost any time. But first you have to notice these butterflies. They’re bright orange and black, but small. They have wingspans of only 1 to 1-1/2 inches, and of course they’re as quick as a wink. They flutter and glide close to the ground, often on trails near fields or damp meadows. Sometimes, once you spot one, you’ll realize that there are quite a few in the same area. Places to look for pearl crescents include the broad paths through the fields at Mass Fish and Wildlife’s Westboro Wildlife Management Area off Rte. 135, the Crane Swamp trail, and the first part of the trail at the Andrews Street entrance to the Headwaters Conservation Area. But keep your eye out for them in other sunny, open places – parking lots, roadsides, power line cuts, and even vacant lots. Many people have never heard of pearl crescents, but surprisingly, these little native beauties are among the most common and widespread butterflies on the continent. They’re found from the east coast to the Rocky Mountains, and from Canada to southern Mexico. 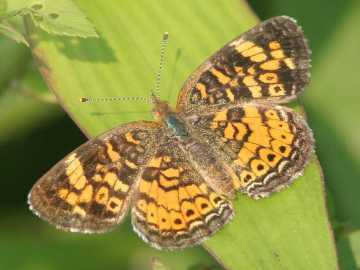 A pearl crescent basks with its wings open to the sun on a wide blade of grass, showing the intricate orange and black pattern on the top side of its wings. What makes pearl crescents so common and widespread? The answer is easy: asters. The caterpillars that grow into pearl crescents have broad tastes. They’ll eat many kinds of aster leaves (though not all kinds), and there are at least 150 native asters in North America, ranging from roadside weeds to garden favorites. In short, food plants for the pearl crescent caterpillars are just about everywhere. Pearl crescent butterflies are also broad in their tastes when it comes to taking nectar. They’ve been recorded at 54 different wildflowers in Massachusetts. Pearl crescents may be small, but they can provide a good opportunity to watch some typical butterfly behavior. Close-focusing binoculars or a single-barrel macroscope can be helpful for getting a good close-up view of small butterflies, but you don’t need this kind of equipment to see what small butterflies do. Much butterfly behavior is all about reproduction – and that’s not surprising, since butterflies are an adult reproductive stage of life. Caterpillars are a juvenile growth stage. In between comes the chrysalis stage – when caterpillars transform into butterflies inside a case – and we might think of that as a protected “teenage” stage. When you’re looking for pearl crescents, you might find them in other places besides flowers. You might discover one – or several – on animal dung along a trail. Feeding at dung is not exactly glamorous behavior from our point of view, but dung is a source of minerals and other nutrients that a butterfly needs to get ready for reproduction. A butterfly that gets nutrients from dung is taking part in nature’s grand recycling scheme. Mud puddles are another place where you might find pearl crescents. Groups of them sometimes gather at the edge of a puddle, taking in moisture and minerals dissolved from the soil. They’ll often stay there while you approach slowly. Males are likely to patrol a territory that attracts females because it contains asters, dung, or a mud puddle. The males fly back and forth, and they also perch on a plant and fly out to chase away intruders. That usually means other males, but pearl crescents are feisty. A pearl crescent may chase away a large butterfly, such as a viceroy or monarch, or harass a bird. The little butterfly might even fly over to check you out. An ongoing chase involving two pearl crescents might turn out to be courtship. Both may eventually land on the same leaf and express their interest with fluttering wings. Females search for caterpillar food plants – asters – by flying low and touching down on plants to “taste” them with their feet. They lay tiny yellow-green eggs in clusters or layers on the underside of aster leaves. Eggs hatch in about 4-10 days, and then the small, spiny brown caterpillars start eating their way down the plant. They grow rapidly and shed their skins several times over about two weeks, and finally each caterpillar forms a chrysalis. About two weeks later, a new pearl crescent butterfly emerges. We usually get two generations of pearl crescents each season. In the fall, late-stage caterpillars go dormant for the winter. They continue their life cycle in the spring, giving us the first pearl crescents of the new season.